This interactive presentation contains the latest oil & gas production data from 10179 selected horizontal wells in the Permian (Texas & New Mexico) through August. Although the data shows a small drop in August, I’m quite sure that once revisions come in, we see a slowly rising oil production in the Permian, from horizontal wells. The effect of revisions is nicely visible now, as in my previous update, March production was just below 1 million bo/d, while now it is just above. As the effect is likely to be stronger for recent months, I expect to eventually see August production around 8-12% higher than currently shown. 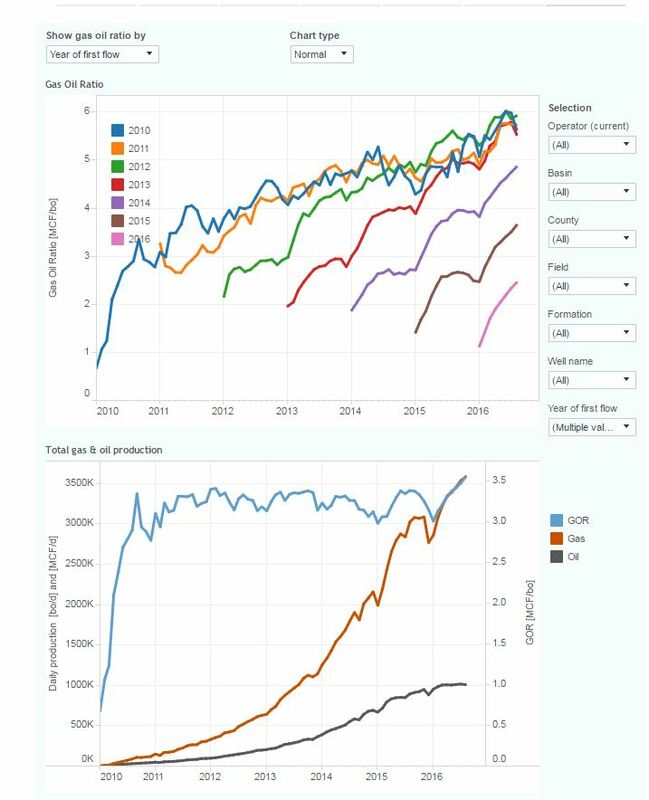 If you switch to gas (using the “product” selection in the top right), you’ll notice that gas production from these wells has risen sharply this year, even before upcoming (typically upwards) revisions. In the “Well quality” overview, we can see that wells that started production in 2016 perform better than earlier wells, while also 2015 wells showed clear improvements over earlier wells. But also in this basin the number of new well starts is lower than in the previous two year, as you can see see in the “Well status” view. I attribute the steep drop in July and August to incomplete data. The last view shows that of the major operators, only Pioneer has kept growing production undeterred during the past year. Its gas production is still lower than other operators, such as Concho Resources, and Cimarex. This first overview shows the path that wells from a certain period are taking towards their ultimate return. The wells are grouped by the month in which they started production (“first flow”). A lot of information is displayed. What I aim to show by this is not the exact change in these paths over time, but very roughly the range of paths that older, and newer wells are taking, from which we can estimate a realistic range of ultimate oil (or gas) return. As we’ve seen already in North Dakota, and the Eagle Ford, the relationship between production rates, and (remaining) ultimate return is revealed quite well with this overview (in my opinion). I think that this dashboard also allows making a reasonable estimation of how much extra newer wells are likely to produce more than earlier wells. I also recommend having a look at the next couple of views, as these show quite nicely how well productivity is distributed over operators, and geographically. The last view (Gas Oil Ratio), shows, as already noted, that recently the GOR has risen across the basin. This is mostly due to the relative increase in gas production from older wells, as the top graph shows that newer wells start with a lower GOR than earlier ones. Next week Tuesday I will have another update on North Dakota, when the NDIC is currently planned to release October production data. Once Ohio publishes Q3 production, I will make a new post on the Appalachia basin. Texas RRC. I’ve estimated individual well production from well status & lease production data, as these are otherwise not provided. Because of these estimations, I recommend looking at larger samples (>50 wells) before drawing conclusions. About 7% of the horizontal Permian wells in Texas are excluded, as these were mixed with too many vertical wells on a lease, making reasonable well profile estimations impossible. I’ve no spud, DUC, or plugging information on wells & DUCs in Texas, so these statuses are unavailable in the “Well status” tab. OCD in New Mexico. Accurate individual well production data is provided. Good info. Appreciate the data. This was sent to me by a friend. When do you update and how dod I get updates. To get a notification when I’ve publish a new post, just follow the link “Get new post notifications” under the “General” header at the top right. 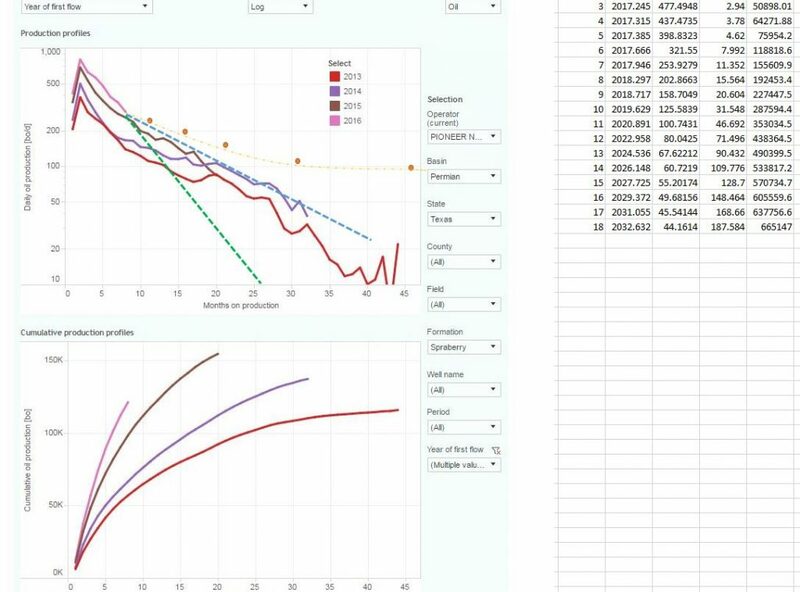 Enno Peters has a projection algorithm to forecast future production from legacy wells. He did this for around 46,000 wells drilled from 2007 through the end of 2015. These are the wells in every major noncon play sans Appalachia, Oklahoma, and Kansas. The Table Below summarizes his findings with regard to the number of wells drilled per year, the average estimated EUR, and the calculated total amount of oil recovery this represents. You see it sums to about 9 Bbbls. His production graph starts in 2010 from these wells. By averaging the January and December daily production, I calculated the total voidage for the year. I then divided the reserve additions by the voidage to come up with a “Voidage Replacement Ratio”. I then calculated the production growth from January to December for each year. 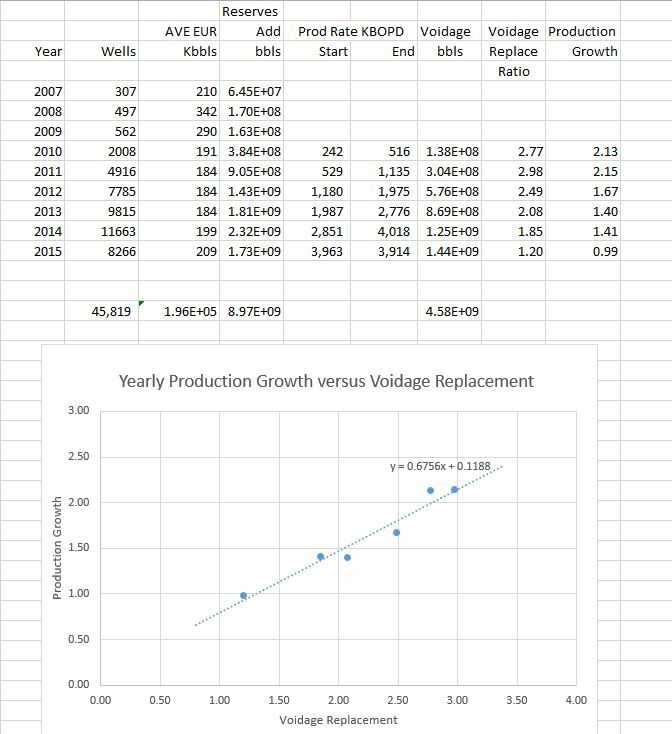 Graphed the results in the form Production Growth Rate versus “Voidage Replacement Ratio”. Nice Linear Correlation. Through the first 6 months of 2016, have lost 9% of January production. If this continues and production growth(decline) is 0.82 for the year, would suggest a Voidage Replacement of 1.07. If the 2,497 well figure is doubled by year end, this required voidage replace would mean that the average well is 260,000 barrel EUR, compared to 209,000 in 2015. Enno did it again. Progressive Evolution of Well GORs in the Permian. Reduction in GOR mirrors improvement in wells. Is your company’ ssuccess about completions or being in a less gassy area? Or does the completion have something to do with it? Or is gas being flared and not measured somewhere that is skewing these data? Bet by the time it is figured out will be too late to do anything about it. Neat stuff. In the World Oil Market, this is the PLACE FOR REAL, NEW,USEFUL INFORMATION. Was recently on a blog discussing the increasing “exponential-ness” of the Permian. How the larger fracs seem to be reducing the transient flow period and exponential behavior is starting early and hanging on. As such, there was a good case to be made that PXD had yet to achieve an average of 200 MBO EUR average. Graph below is the evolution of Pioneer wells. Green line is 160 MBO EUR, Blue line is 200 or just over. 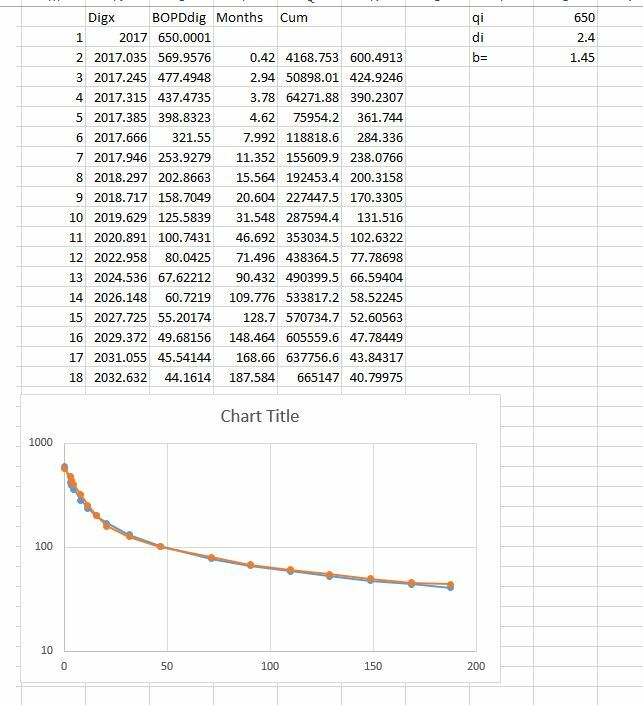 Petroleum Engineer on the blog ran a model, screen digitized result of his model run are the large dots/ gold curve. His EUR is 700, I think Pioneer is claiming somewhere in the neighborhood (oil only). I say good luck with that. Appreciate the support Jim, and thanks for the interesting comments. Your welcome. The curve above comparing recovery scenarios is a milestone in the process of trying to determine the true cost of these reserves. For too long, companies have hung a hyperbolic on a 30 or 90 day curve under the most optimistic assumptions, IMO. Without your database how would it be possible to validate these claims en masse? The next 12 months is going to be fascinating. Have popcorn roll film. Hello Gregg. Good to see you on here. You still working with KC, Charlie and Mark? Tell them Hello for me if so. Jim, what type of b factor must one use for that PXD Gold Type Curves’ Harmonic Decline? Gotta be 1.6+, no? Geesh, what they are apparently not teaching in university anymore to these PEs is mind-boggling. 1.45 or so is pretty close to an overlay. Man are we nerds or what?